While the quinoa is cooking, cut your small tomatoes in halves, dice the onion, and chop up the cilantro. When the quinoa is finished and in the process of sitting for its 15 minutes, that’s when you want to saute the onions. Put the olive oil in a large skillet, along with your onions. When they have been in for a few minutes, add the beans, chili powder, and cilantro. 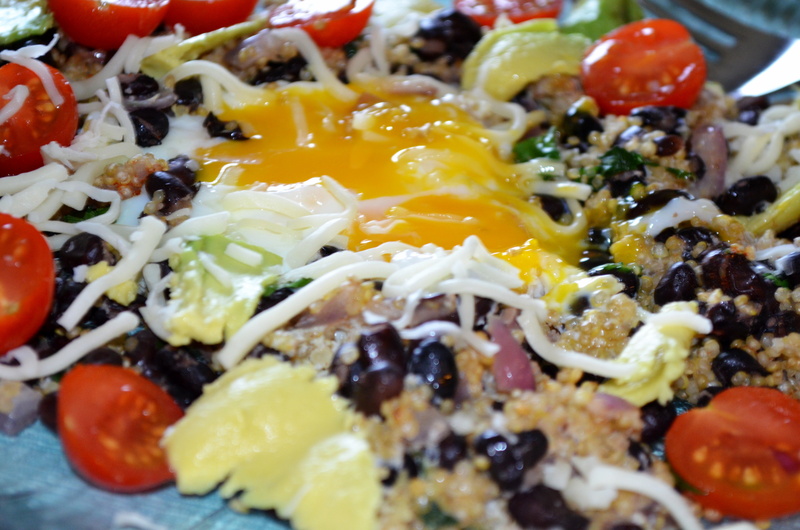 When quinoa is ready, add it to the beans in the large skillet. Move the quinoa, beans, and onions towards the sides of the pan, leaving room in the middle. Put the four eggs in the middle, making sure not to break the yokes and leaving enough distance between them that they would be hard to get out later. Turn your oven onto Broil. Unless your pan can tolerate the high heat, leave the door open and your handle out as you broil the dish for about 2 minutes. Like I have mentioned before, make sure you use a skillet that is safe to do this with, and be careful that the handle doesn’t get too hot. You may need to grab it with a pot holder, even though it has been outside the oven. While this is going on, slice open your avocado and get it ready to scoop out. When the eggs are cooked to your liking, serve on a plate with tomatoes, avocado, and Monterrey Jack cheese. No, you haven’t! I am with you Joanna! I LOVE, LOVE, LOVE me some cilantro! Mexican-inspired dishes are always a hit. Plus anything with eggs, right?? Yum! It was Ayesha! Thank you! Yum! Such tempting photos Lori… love the combo of ingredients! All the things I like in this one. Looks so good! Maybe I will try it this weekend. Thanks for posting! Thanks Arlene! We really loved it! I could eat this every morning! 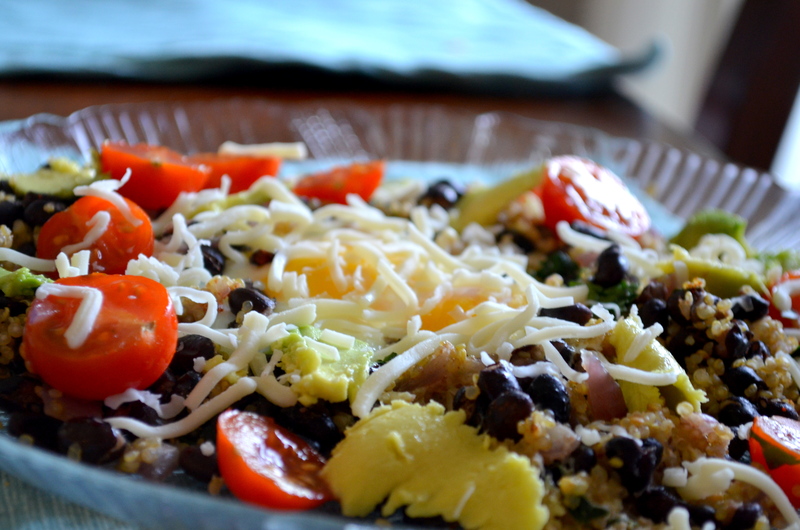 And you come away feeling so satisfied and filled up because of the beans and quinoa! Yummy!!! Love any food with Mexican flavors! Erm yum and healthy I think? Windy too!